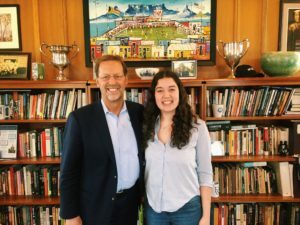 This past week, I had the opportunity to sit down with President Dan Porterfield to conduct his final interview for The College Reporter as he completes his final semester at F&M. Dr. Porterfield came to F&M in March of 2011, and over the last 7 years he has spent his time working to promote the democratization of higher education through F&M’s talent strategy, as well as to establish F&M as a national leading liberal arts college. During our interview, he discussed his decision to leave Franklin & Marshall and become President of The Aspen Institute, what he will miss most about F&M, and of course, the fate of his famous ice cream freezer. The impact that Dr. P has left on F&M not only as an institution but as a community is immeasurable, and he will be dearly missed. Best of luck, Dr. P! Ruby Van Dyk: Many of us don’t really know the story of how you came to F&M, your background, etc. Would you mind sharing a little bit about how you ended up here? Dan Porterfield: Prior to coming to F&M I was senior vice president and English Professor at Georgetown University, as well a faculty member living in residence. I was at Georgetown for fourteen years, and for the last eight I lived with my family in one of the Residential dorms. We raised our kids at Copley Hall, and for those eight years we were known as the family in the building. During my time at Georgetown, I was responsible for strategy. The administrative work that I was doing at Georgetown was similar to the work I’ve done here at F&M. But as well, directly teaching and living with students allowed me to develop a skill set that was relevant for leading a liberal arts college as president. A liberal arts college is a complex institution with financial concerns, legal concerns and it needs to develop a strategy for its future. But on the other hand, it’s an intimate place where student-faculty relationship is prized and where the growth trajectory of each and every student is crucial. I had a background both in institutional leadership but also in undergraduate education. So, just as there is currently, there was a search process for F&M’s next president that included students, faculty, alumni and members of the board of trustees. They interviewed candidates, and I was offered the position. I started on March 1st, 2011. RV: When you first came to F&M, what were your goals. Do you feel like you have accomplished them? DP: I feel great about my time at F&M, the people that I’ve worked with, the students and alums I’ve gotten to know, and the impact we’ve made together for our students and society. I don’t think that any work is ever done, we are always trying to get to the promised land but the day you think you are in the promised land, you aren’t. When I first came to F&M, I focused a good deal on a lot of listening sessions with every department in the school, academic, administrative, extracurricular, open meetings with students and alumni, and conducted a full-scale research project to understand what those who loved F&M thought about its strengths along with what it could improve. We deemed it a Strategic Positioning Research Project. I really recommend anyone who comes into a new position at an institution to do this, I’ll be conducting one at The Aspen Institute. From there, we developed a strategic plan which was named “Claiming Our Future”; we’ve been implementing that plan ever since. Among other things, the plan consisted of developing a national recruitment strategy, a robust financial aid budget, developing our career center into a full-service center for students, as well as reconstructing our student health center. In the ways that I listened at the start of my time at F&M, I heard loudly and clearly from everyone involved that they wanted F&M to be a leading national liberal arts college. How? In ways authentic to F&M, empowering to students, relevant for tomorrow, and sustainable for generations to come. That sentence unifies so much of the work we’ve been pursuing. If you look around at the student body, virtually every student wants to be attending a top liberal arts college. These kids are who want high intensity, who value their education, want to grow, have ideas about changing the world, and want to leave an impact on this campus and the world. That is powerful. I have a slogan, “We create the education we seek” and that’s what we’ve been doing, recruiting students and faculty who want to do that. I’m sure with the next president, a new set of goals and strategic plans will develop, in order to enhance what we offer our students, and society. RV: Is there anything that you regret not instituting or completing during your time at F&M? DP: I would say every opportunity to serve, requires us to make choices and it’s hard to do it all. There are some things I miss doing. I had to give up classroom teaching, which I really miss. Secondly, we are building a game changing visual arts center that will allow the arts to have an absolutely stellar place. I was integral of the selection of the architect, the planning, and fundraising, but am going to miss opening that door. Thirdly, I have been writing a lot and have been drafting a book during my F&M on meaning making, in the setting of Franklin & Marshall College. The book has six essays that look at students as discoverers, creators, collaborators, mentors, change agents and then the last chapter focuses on the future of our country. Although I’ve made a lot of progress, I would have loved that book to be released while I was still here. But as I said, every leadership opportunity requires us to make choices, so do the best you can, and then pick up that project from the next opportunity you have. RV: What is your fondest memory from your time here at F&M? Is there something that stands out in particular, or perhaps a ritual that you will miss? DP: My fondest memory is a compilation of a thousand memories shared with students, as I either observed what they were making and creating, partnered with them to come up with an idea, or mentored them at an important decision point. Those have been my favorite moments. My favorite ritual is the moments when I’m sitting in this office, and I hear the rustling of footsteps in the vicinity of my ice cream freezer. RV: That is also a pressing question, will the ice cream freezer remain in the president’s office? DP: I think there is a chance the ice cream freezer could end up in either the Admissions office, or in the office of Cristina Diez and Dr. Donnell Butler, Office of Student Success. I don’t want to impose it on them, but it is theirs if they want it. I left my white freezer at Georgetown, now I have my sort of Porsche-like black freezer here which I will leave behind, and I am planning on getting an F&M blue freezer for The Aspen Institute. RV: What are some of the factors that led you to decide to move on to the Aspen Institute? DP: It is a very painful decision to leave an experience before you are ready to leave it, especially one that you love. That is exactly what happened at Georgetown. I loved living in that dorm and teaching my classes. But the chance to be a President of a college spoke to my desire to be a difference maker. I knew that F&M was an outstanding academic institution, so I thought, “I am going to leave behind something that I love in order to find another way to make an impact, to work with people that I don’t know, to serve kids in society.” I have loved the almost seven and a half years that I have spent here, because of who the people are and what the mission of the school is. When the Aspen Institute search committee called me and told me they’d like to discuss me possibly becoming their President, I went through a period of reflection. I tried to discern what would be my calling for the next phase of my life, and ultimately what made me excited to join the Aspen Institute was that I felt like I could advocate for the values of Franklin and Marshall College and young people in general on a national platform. I also felt that our country in some ways is moving in a dangerous direction. Our society needs to invest in the young, in education, health care, in job opportunities, and if we don’t, we will be very sorry. I think one way to invest in the young is to work directly at a college, with students and faculty directly like I’ve been doing here at F&M. But now, I’m going to leave something I don’t really want to leave, in order to try to make an impact on the national level with my voice and my organizing ability. I feel in order to honor what we’re doing at F&M, I have to go out and advocate and fight in other arenas. That’s what I’m doing, I’m not leaving it, I’m bringing it with me. I am also excited about the ways that The Aspen Institute will overlap with F&M. Two F&M students have internships with Institute this summer in Colorado, where I will also be this summer. There are also two F&M graduates who received scholarships to come to one of the summer programs through Aspen called Spotlight Health. I’m very excited that there will be many opportunities for me to stay connected with F&M students. For example, there is this big project called the American Talent Initiative. This is the name of the work we’ve been doing here at F&M, in which we use our aid policy to recruit from the full American mosaic. When we first implemented the initiative during the first few years I was here we experienced rich success, and other institutions and journalists took notice. From there, The American Talent Initiative was developed, funded by Michael Bloomberg, we set an initiative along with other liberal arts schools to get 50,000 more Pell Grant students enrolled in any school with a 70% graduation rate by 2025. The initiative now consists of 100 schools, is Bloomberg funded, and F&M led, but the entity that is funded to run it, the staffing, is the Aspen Institute. Before I even knew I’d ever end up working there, I picked the Aspen Institute as the staffing vehicle to run the initiative. So, all things come together. I will still be part of the steering committee of that initiative, and F&M will remain one of the central players. RV: What advice would you give to the next president of F&M? DP: I think the most important advice is to engage. Get to know student, staff, faculty and alumni. Be a first-hand witness whether it be in student government, college houses, or theatrical productions. This is a deeply engaged student body, powerfully and passionately invested in meaning making. Joining these faculty and students and participating in that meaning making will have richness and joy that will far transcend the expectations one has for a job. RV: What do you consider to be your legacy at F&M? What would you like to be most remembered for? DP: I don’t actually have that as a goal. For me, my goal is to always be able to draw upon in my future work the friendship and excellence of members of the F&M community, so I can enjoy the feeling of continuity and an ever-widening circle of friends and difference makers, with F&M at the center of that circle. So, for me, the most important thing is what is the legacy of F&M in me, and for me it’s going to be the richness of these relationships, the earnestness and desire of this community to make a difference, and the all-around excellence in education that F&M stands for. Dr. Porterfield has had a significant impact on the F&M community. If you have any more questions or would like to learn more, you can contact him via email at dporterf@fandm.edu.